to play with and here are two cards I have made using it. I also inked around the center square card and the center and outer edges of the chrysanthemum die. Added a matching brad and I was done. 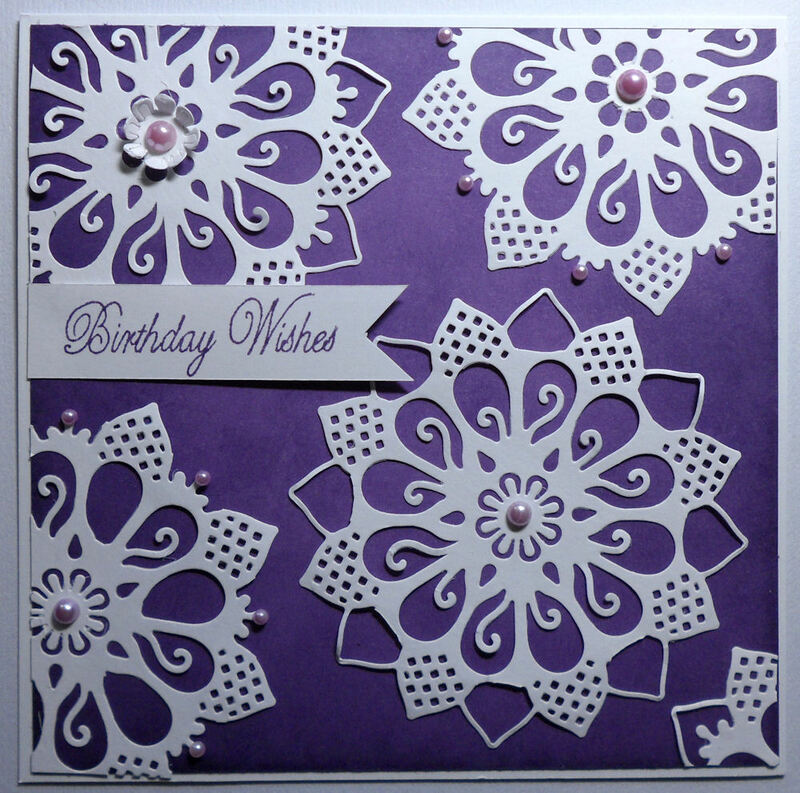 My next one was done on purple card and using Dusty Concord Distress ink to distress the edges. 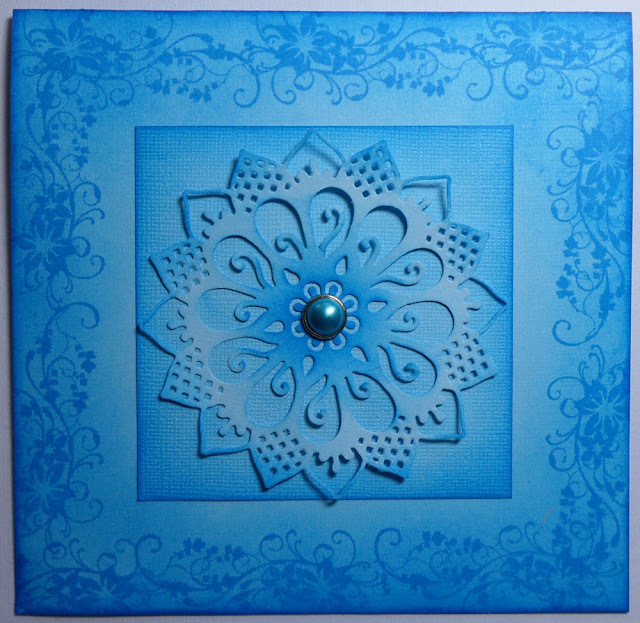 I then cut out several of the Chrysanthemum Die Versions 121 Die and cut out different sections of it to give four different looks added a few flat backed pearls and my card was done. Thank you for visiting I love to know you stopped by, by leaving a comment. 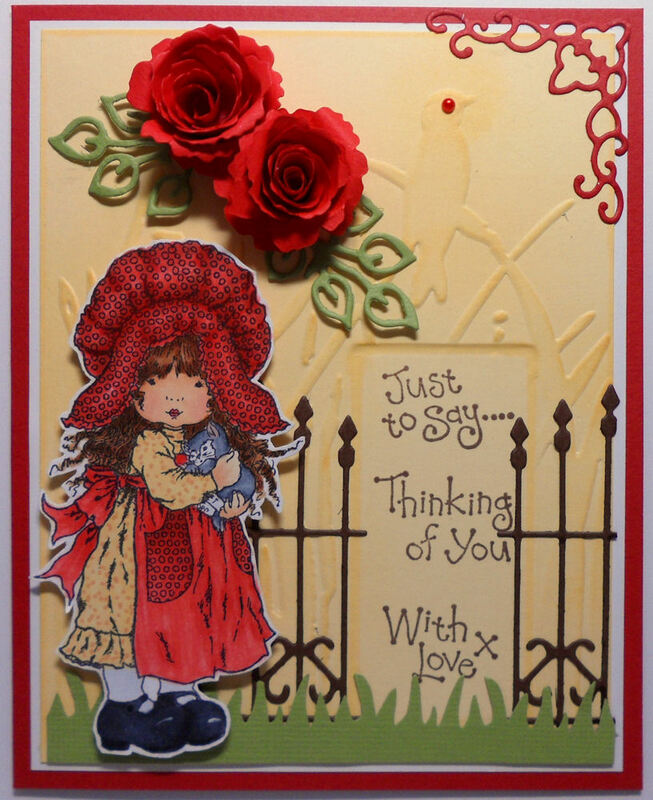 Hello bloggers, I have another card to share using the Sarah Kay Babette stamp. I have coloured her with copics, the kitty is actually gray but the camera has chosen to show it in blue. I used the Cuttlebug embossing folder Bird Call and used the one of the Easy Folder Frames for the sentiment section. The gate is the Cherry Lynn Ornamental Gate Die B196. Roses were made with the Royal Rose Die-namics Die and leaves are the Marianne Creatables leaves 1 die LR0226. Grass is a Fiskars border punch. Thank you taking the time to Visit. 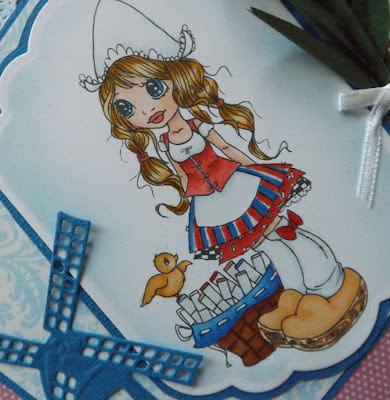 Krista Smith from Saturated Canary has drawn a sweet Dutch girl digital image for the new Dutch Canary Challenge Blog, you can get the image free through email if you are a follower and use the image to enter the September Challenge. 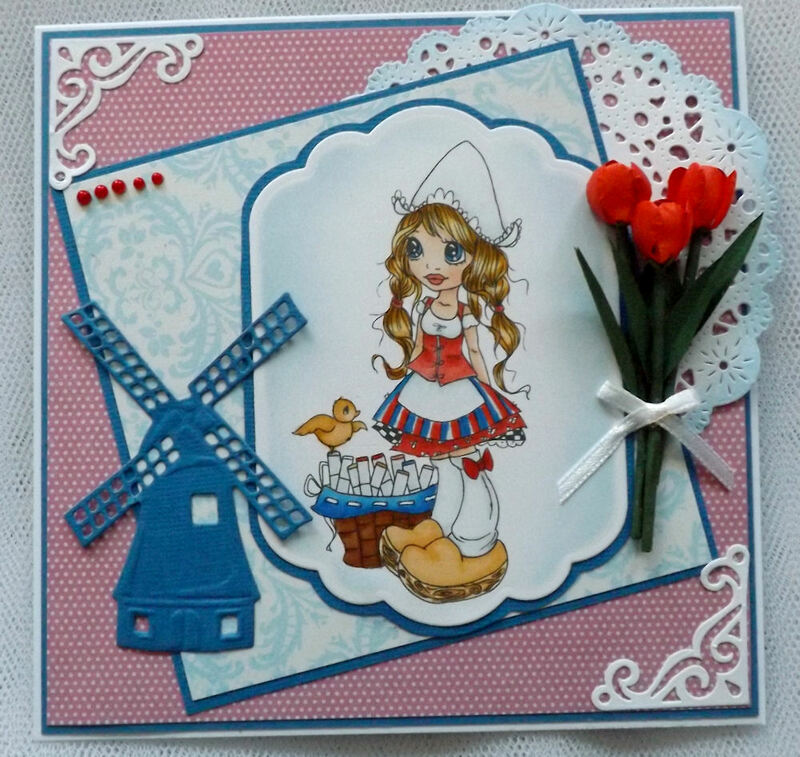 Here is my card using the lovely image, being a dutch born girl I just love her. 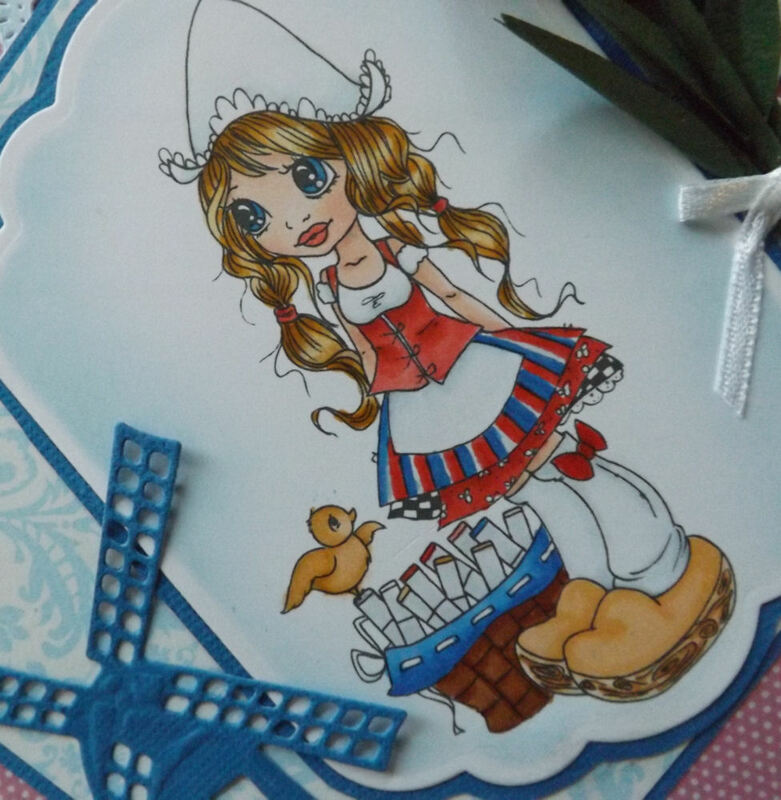 I coloured her with copics, cut her out with Spellbinders Labels eleven. The doily is a Cheery Lynn die. My photography seems to be getting worse, but you get the idea - right? I thank you for taking the time to visit.